Growing up in a typical American house would lead one to ignore the ceiling as a decorating opportunity. There it is, flat drywall painted (what else?) ‘Ceiling White.’ Old houses may once have had decorative ceilings, but today most of those have been painted over. What a shame! The ceiling is the one unbroken plane in the room—a surface always in evidence, particularly when one is receptively lying on the couch. Any treatment it is given will stay relatively pristine in these days of smokeless heat, as the ceiling suffers little wear and few dirty fingerprints. 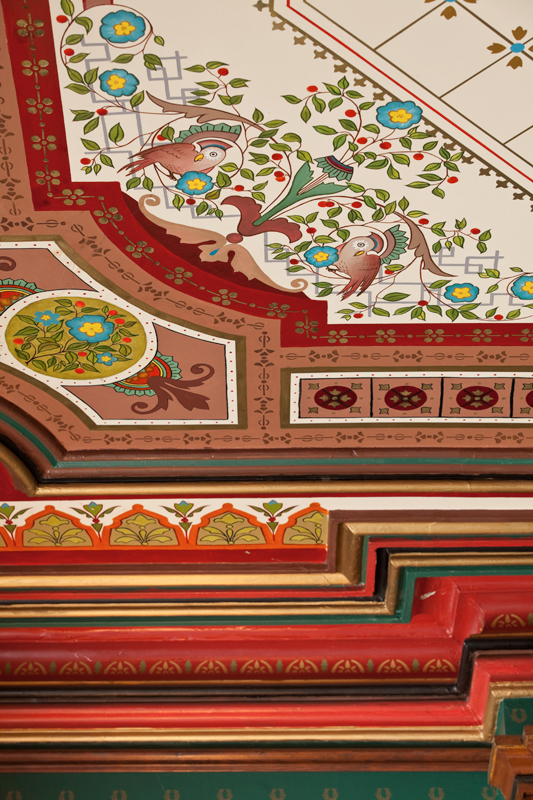 Throughout decorating history (even in American residences), the ceiling was embellished with color, striping, cast plaster ornaments, corner fans, borders, specialty papers, and murals. It has been made of plaster or boards, and clad in beadboard, coffers, mosaics, and metal. 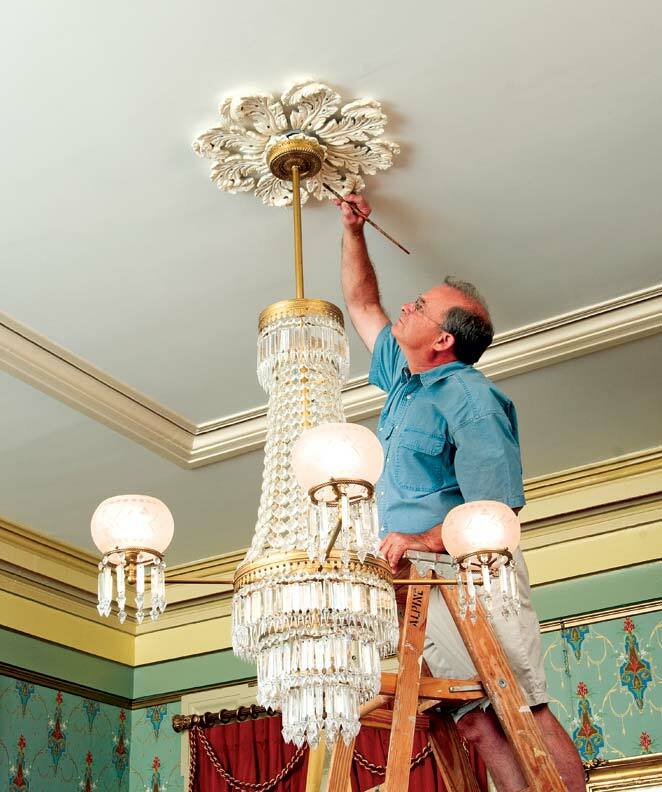 While stenciled decoration appeared earlier, the Victorian era was the heyday of the decorative ceiling. With ceiling heights of 9&apos; or more on the main floor, decorators always considered the ceiling along with the walls. At its simplest, the ceiling may have been painted white tinted with a bit of the wall color, with a stripe around the perimeter and maybe tiny corner fans. In general, the higher the ceiling, the more elaborate the decoration. Full embellishment included a border or two, corner treatments, a center rosette, and a field—done in paper, freehand painting, stenciled decoration, or a combination of those. The decorative ceiling was still important between 1901 and 1945. 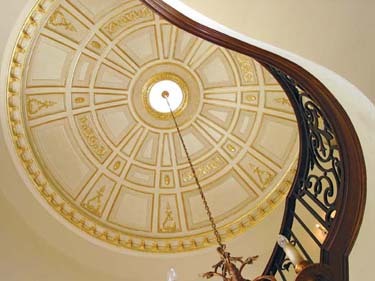 Shape took precedence over decoration: There was a vogue for coved ceilings for houses in neoclassical, Tudor, and Spanish styles—that is, a concave arc of plaster that formed a transition between the wall surface and the ceiling plane, with no right angle. The cove might be treated, decoratively speaking, as part of the ceiling or as part of the walls—each gave a different effect and altered the perceived height of the room. The cove might be ornamented with applied plaster in a “wedding cake” manner, often with swags, and decoration sometimes carried over onto the ceiling plane. Pressed metal decorative ceilings were popular. 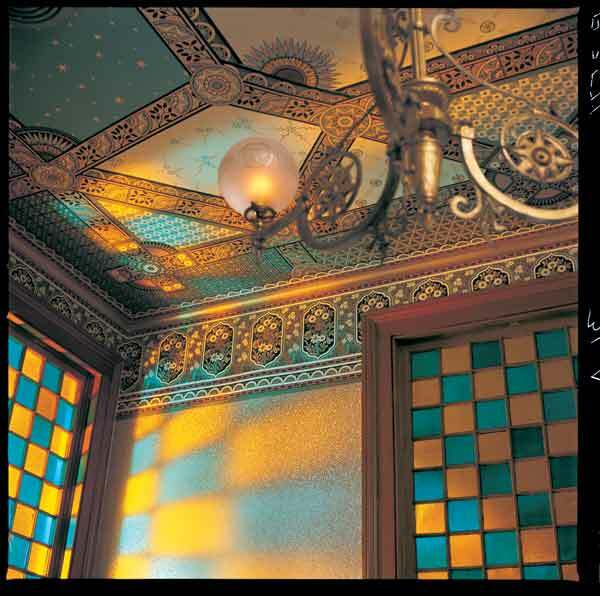 Alternately, it became fashionable to lower the picture molding from 9" to 18" below the ceiling, creating space for a stenciled or papered frieze on the wall. After the first World War, Romantic Revival house styles were built in the growing suburbs. Many walls, and the occasional ceiling, were troweled with rough or textured plaster, to give a romanticized impression of age and patina. Ceilings were not universally monochromatic in this period, as they were in Colonial Revival homes. 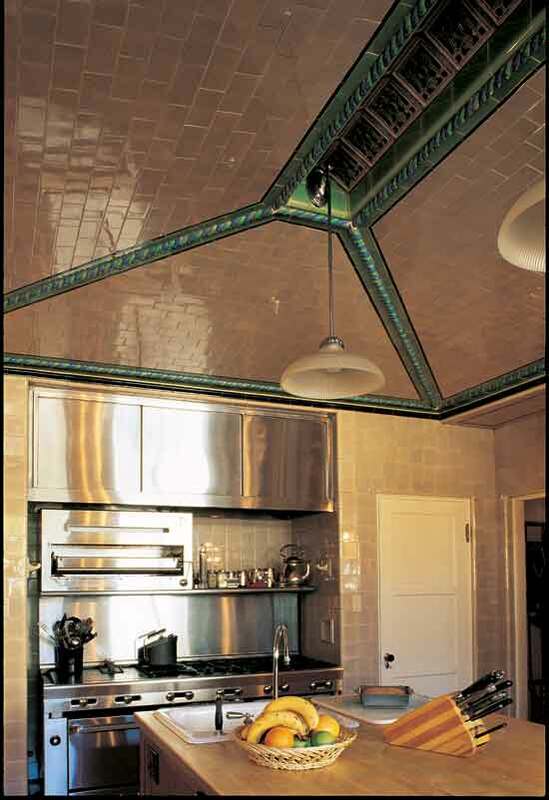 In fact, there was a revival of decorative ceilings for Spanish Revival and Italian Villa homes. Wood coffers, colored stains, and stenciling on or between beams were all popular treatments. 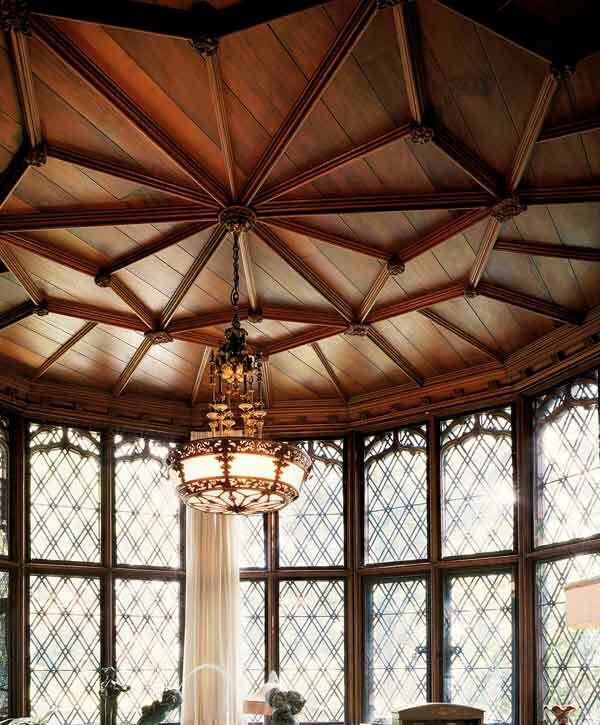 Tudor Revival houses had ceilings with heavy beams, or with “Jacobean” plaster featuring intricate tracery. Panels between beams were painted with medieval or Tudor motifs, or covered in embossed leather or Lincrusta. After the Depression came a notable change toward Modernism. Gone were cornices and moldings, as plaster met plaster at a right angle. White ceilings were what we grew up with. 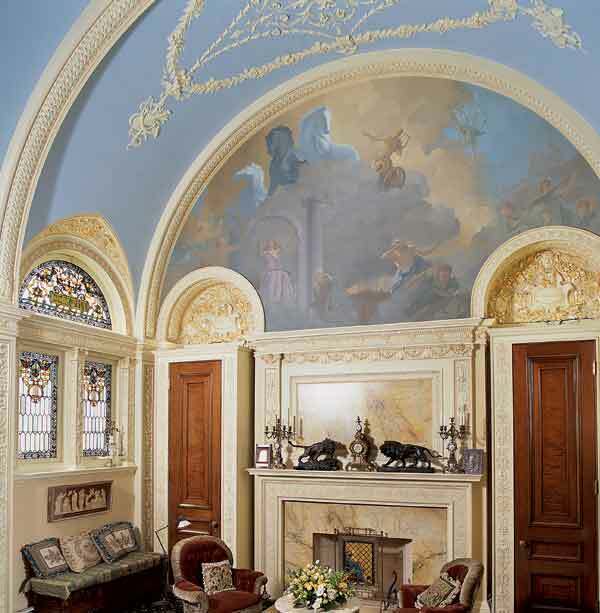 For decorative ceilings sources, see the Products & Services Directory.